Scott has been a professional disc jockey for the better part of a decade, catering to all types of events from weddings to corporate functions; stag & doe parties to fundraisers; bar restaurants to nightclubs. The experience he has obtained during that time is an asset he brings to the table when assisting you in your next event. Scott prides himself on bringing options and alternatives to any special event. Being able to present that perspective comes from his years of experience not only as a disc jockey, but an audio/visual professional as well. He's fully comfortable performing basic master of ceremonies duties, and working with banquet hall or event staff to ensure that everyone is on the same page, delivering the exceptional event our clients have put so much thought into. 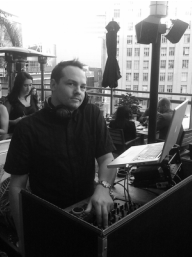 As a DJ, Scott has worked throughout Toronto and the great Toronto area in such venues as J Lounge, Club 279 (Hard rock Café), Tiger Bar, Ten on 10 Nightclub, Sloppy Joes, The Annex Wreck Room, Crocodile Rock, The Boat, Alice Fazzoli’s (Adelaide & Square One locations), Shoeless Joes (King St. W), as well as being the resident DJ at Jack Astor’s (Dundas Square & Whitby locations) for 2+ years each. When it comes to special events, he has worked in conjunction with the WWE, UFC, MLSE (Specifically Toronto FC & Toronto Raptors), various spirit companies such as Jack Daniels, Smirnoff and Budweiser Canada as well as various organizations such as Hope-Halton Pride Festival & Universal Entertainment. ​It was a pleasure to have you as our DJ for our special day. The day went off without any issues. The music and atmosphere you provided was perfect. We even received compliments from the bar staff at the venue regarding the selection of music as it was not just the normal wedding standards that were played all night long. You definitely added to the day in a positive way and it was nice to hear from others who weren't even guests. We had a fantastic time at the wedding and you did a stellar job on the entertainment...We had so many compliments on your DJ skills from guests. I know I danced up a storm that night! Couldn't get me off the dance floor. Scott DJ'd our wedding in February 2015. He took a lot of time ahead of the event to understand our tastes and preferences and to ensure that we had the opportunity to pick the music for every special point in the evening. At the wedding Scott was professional and did a great job reading the crowd, which meant that everyone had a great time.